Lucky Girl Cheer Bows operates out of Southern Chester County, Pennsylvania and has been making hair bows for cheerleaders since 2008. Bow maker Pam McKamey is a graphic designer who brings her layout, color and typography skills and eye for detail to each and every bow she creates. All our bows are reinforced for durability and constructed to stand up and hold their shape. We are continuously experimenting with materials, fabrics and construction to bring you some of the best-looking, best-built bows you can buy. In addition to the bows you’ll find for sale on our website, Lucky Girl Cheer Bows works with cheer gyms to custom design team orders. 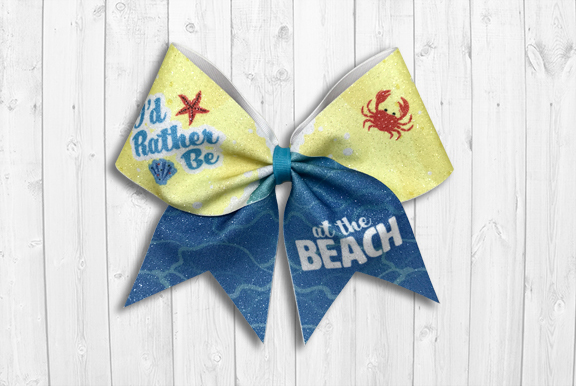 Contact us or visit our Team Orders page for details on how we can create coordinating bows for your athletes’ uniforms. We also love making pretty boutique hair bows for girls of all ages. Our product offerings will be regularly updated with new items, new categories and new designs so please visit often!